This situation arises in cell nuclei and in the protein shells of viruses, as well as in the heads of sperm cells. The phenomenon is also interesting from a physical perspective because it represents a phase transition, of sorts. DNA double helices, which normally repel each other because of their negative charges, are then packed together tightly. "In this condensed state they take on a nearly crystalline structure," says co-author and TU professor Friedrich Simmel. This is like a domino cascade at the nanoscale. The result was compact layers of DNA molecules, packed as densely as they are in cell nuclei. All DNA molecules fell along the predefined path. "This is a very dramatic process," says Simmel. "The DNA is instantly bundled in a single direction." The researchers thus have a further building block for creating artificial cells on the surface of chips and studying all associated phenomena. 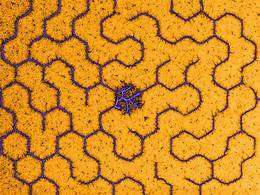 "It is quite plausible to implement cell-like systems with densely packed DNA on a chip," says Simmel. DNA condensation could then be used to improve the control of gene expression and copying of genetic information in these kinds of artificial cells. Friedrich Simmel would not be a passionate researcher if he did not, in addition to technical application perspectives, have his eye on basic physics. "We also want to understand the conditions of the phase transition during condensation," says Simmel. "For this we have ideal conditions on the chip. We can precisely control where the condensation occurs and how long it takes." This is somewhat like supercooled water or beer in the freezer box, in which the liquid freezes abruptly starting at a specific point with a crystallization seed and then spreads outwards from there. The only difference is that the phase transition is not controlled by temperature, but rather the concentration of positively charged molecules. The research was funded by the Volkswagen Foundation, the German Research Foundation via the Excellence Cluster Nanosystems Initiative Munich (NIM), the Israel Science Foundation and the Minerva 80 Foundation.